Mr Monkey caught a bus into Manchester, had a quick scurry around the Christmas Market in Albert Square, then scampered along to the press night of Guys and Dolls at the Royal Exchange Theatre. Opening on Broadway in November 1950, Guys and Dolls was written by Frank Loesser, the book bring written by Jo Swerling and Abe Burrows. It is based on two short stories by Damon Runyon, The Idyll of Miss Sarah Brown and Blood Pressure, with extra characters such as Nicely-Nicely Johnson, Harry the Horse and Angie the Ox brought in from various Runyon stories, plus a lot of invention in the style of Damon Runyon. This production is co-production with Talawa Theatre Company, the primary Black theatre company in the UK. 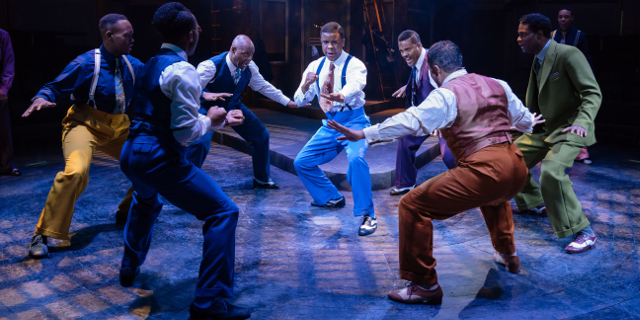 The is the first UK production of Guys and Dolls with an all-Black cast; to reflect this action has been moved up Broadway to 135th Street in Harlem. There are two main plotlines in Guys and Dolls. In the first, Nathan Detroit needs to find a place to hold a craps game while not letting his long term fianceé - they've been engaged for 14 years - Miss Adelaide find out that he is still involved in gambling. This leads to the second plotline in which Detroit bets compulsive gambler Sky Masterson that Sky cannot persuade Sarah Brown of the Save-A-Soul Mission to stop trying to save souls on Broadway and spend a night with him in Havana, Cuba. After a series of misunderstandings, arguments and some excellent songs, there's a happy end for more or less everyone. 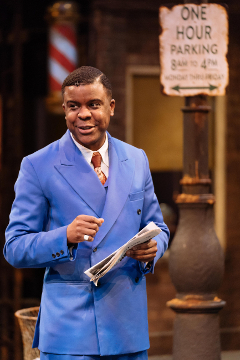 The stage set recreates a street corner in Harlem, specifically the junction of Broadway and West 135th Street, according to the signs on a lamp post. There is all the street furniture Mr Monkey expected to find around a New York street corner - a fire hydrant, a trash basket, grids leaking steam, and a bright neon sign. A bank of seats has been replaced with a small drugstore with a nine piece band in an upper room. Scenery changes move the action to the Hot Box nightclub, the Save-A-Soul Mission, a Harlem sewer, and a bar in Havana, but the action always returns to the corner of Broadway and West 135th. This is a brilliantly exuberant production of an excellent musical. The dance routines use all the available space, especially in the wonderful scene in Havana in which none of the actors speak or sing but still express their emotions perfectly. Everyone except the Save-A-Soul missionaries and the cops is dressed in bright clothing which looks perfect for Harlem just on the verge of the zoot suit era. Mr Monkey did find that the music occasionally covered the words, but that might have been to do with where he was sitting. 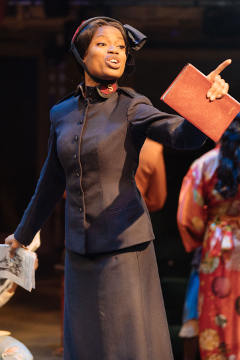 Mr Monkey thought that Abiona Omunua was excellent as Sarah Brown - marvellously uptight when she first meets Sky, mellowing after drinking milkshakes with 'local flavouring' in Cuba, and reverting to her uptight persona back in Harlem. Ashley Zhangaza is great as Sky Masterson; though Mr Monkey was a little unimpressed on his first appearance, he soon got properly into the character. The other loving couple - Lucy Vandi as Miss Adelaide and Ray Fearon as Nathan Detroit - worked well together. Joe Speare is an appropriately intimidating Big Jules, the sort of citizen you would not argue with when they are playing with dice from which the spots have been removed. 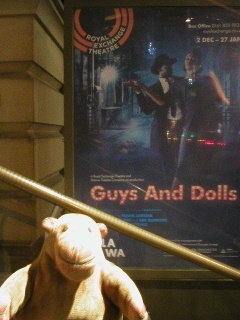 Mr Monkey thoroughly enjoyed this production of Guys and Dolls, and recommends it to anyone who wants a colourful and joyous night out with a live band and a fine theatre company. Guys and Dolls runs until 3rd February 2018.